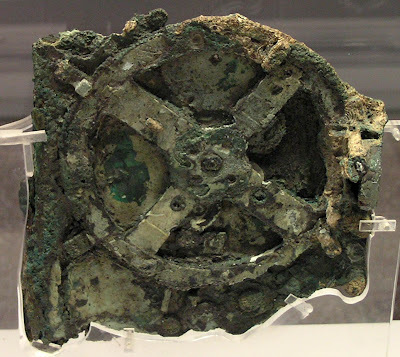 Past Remembering: The Antikythera device: 2,000 year old clockwork? "Though it is over two thousand years old, it represents a level which our technology did not reach until the eighteenth century. If the insight of the Greeks had matched their ingenuity, the industrial revolution might have begun a thousand years before Columbus. By this time we would not merely be puttering around on the Moon, we would have reached the nearer stars." -- Arthur C Clarke in "Technology and the Limits of Knowledge"
"In 1900, on the day before Easter Sunday, a team of divers discovered a shipwreck off Antikythera whilst attempting to find sponges. The sunken ship's hull was full of bronze statues and other ancient artifacts that were later retrieved and delivered to the National Archaeological Museum in Athens for cleaning and restoration. It was not until 17th May, 1902 that a leading archaeologist examined the artifacts and recognized the outline of cogwheels in one of the lumps of bronze and wood. 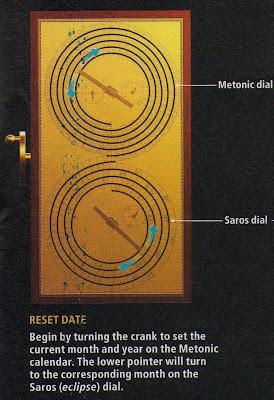 The writing on the case confirmed that the item had been made in 80 B. C.
In 1958 Derek J. Solla Price, an Englishman who then worked at Cambridge University and who later worked as the Avalon Professor of the History of Science at Yale University in America, examined the mechanism. Using a process for restoring oxidized objects, Dr. Price was able to salvage some of the mass and from these pieces he attempted to rebuild the device. 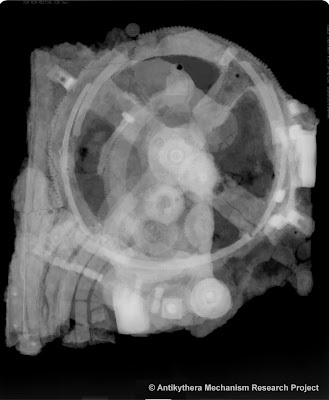 However it was not until 1971 when X-ray photographs were taken of the artifact by the Greek Atomic Energy Commission, that the mechanism's array of meshing gears was finally revealed. Price remarked that, "nothing like this instrument is preserved elsewhere. Nothing comparable to it is known from any ancient scientific text or literary allusion. On the contrary, from all that we know of science and technology in the Hellenistic age, we should have felt that a device could not exist". Work on the artifact revealed that on the outside it had consisted of dials set into a wooden box with at least 20-gear wheels inside. 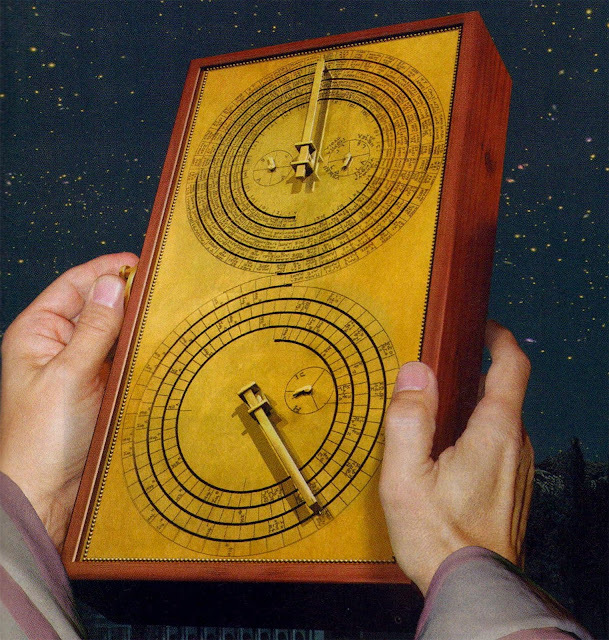 The box was covered with inscriptions that included an astronomical calendar. The mechanism also included a system of differential years. A crank spindle set the gears in motion at various speeds, turning pointers on three dials that calculated the rising and setting times and phases of the Moon, and the positions of the planets Mercury, Venus, Mars, Jupiter and Saturn all with a high degree of accuracy . " It could well be that the technology is pre-Greek, since there are no other indications that they had this type of technical ability.